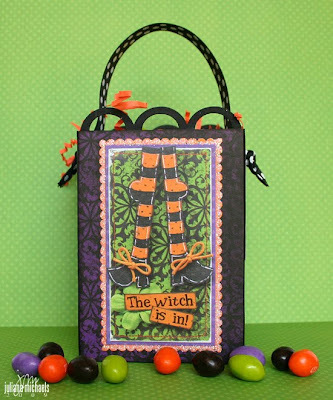 October Contests & Challenges at Magistical Memories! 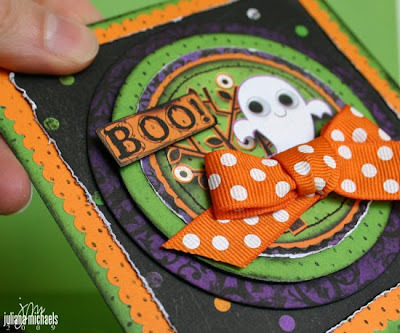 Today I am sharing my October Magistical Memories projects with you! 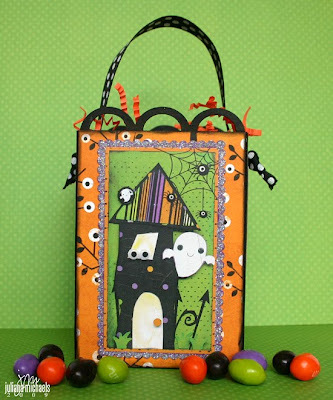 For my first project, I used the Scallop Lace Book to create this fun little Halloween treat bag. I cut 2 of the pages to the same height and then cut the sides and a bottom from chipboard. I used masking tape to hold all of the pieces together. I painted the inside and outside of the bag black. I then covered each side of the bag with pieces of pattern paper, stickers and glitter. 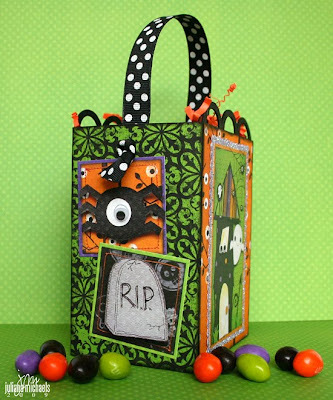 I finished by filling it with some yummy Halloween peanut M&M's!!! My second project was created for the October contest. 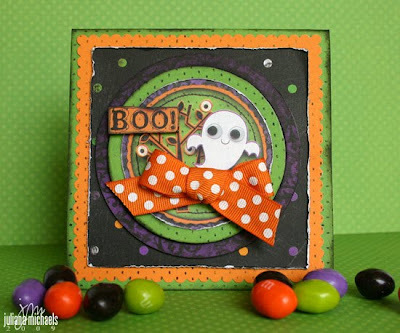 For this months contest you are to create a Halloween or harvest themed card. I created my card using the Nesting Circles. I covered them with patterned paper and used them along with some foam tape to give more dimension to the cardstock sticker. My third and final project that I am sharing today was created for the October challenge. For this months challenge you are to use a tic-tac-toe grid as inspiration. I chose to use the actual grid design as my source of inspiration and I used this to determine how to place my photos in my photo collage. 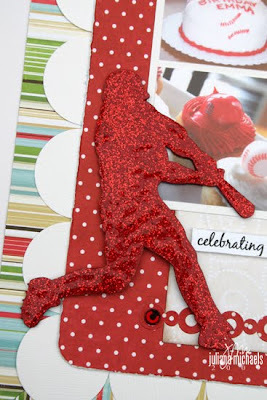 I used the Baseball player silhouette on this LO and I painted it red and then covered it with red glitter glue. You still have plenty of time to enter your creations for the October Challenge and Contest for a chance to win some free Magistical Memories chippies!!! 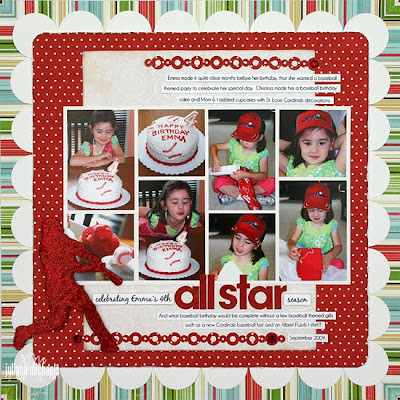 I love how you used the chipboard album- so creative! 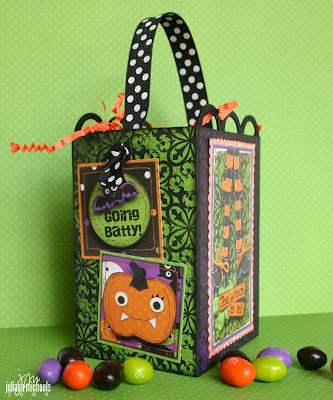 Fun Halloween projects, Juliana! Love the colors and layering - so pretty! Sounds like a good contest - I love your glittery effect on the baseball player! these are all so fabulous, juliana!! I especially love that treat bag - it's sooo cute!! every project is fantastic Julia! Very clever use for that mini book - WTG! How adorable! I really love the treat bag! hi girl, i haven't visited blogs in awhile but miss yours for the inspiration. ;) love your halloween'y' creations!! !